Monday: Did not get it together today. Did teach two water fitness classes in the morning but that is not running. Tuesday: Taught two water fitness classes in the morning then worked that night but stayed after work and ran 3 pathetic miles. I thought maybe I had forgotten how to run at this point but made it through. Wednesday: Decided to get it together today. Woke up at 6 and ran 3 miles on the basement treadmill before Gretchen woke up. I only had one water class to teach so I had time for 1.5 miles before I needed to leave to get home and attempt to register for the Marine Corps Marathon. Failed at that but whatever there are plenty of other marathons that need to be ran by me. Went back to the gym that evening for 5.5 miles. Thursday: I was determined to run another 10 miles today even though my body wasn't feeling it I didn't have any water classes to teach so no excuses. Well then I started running on the treadmill at the gym and my inner thighs reminded me that I had gained 5 pounds in the past week probably those 3 days of not working out and eating like a pig. 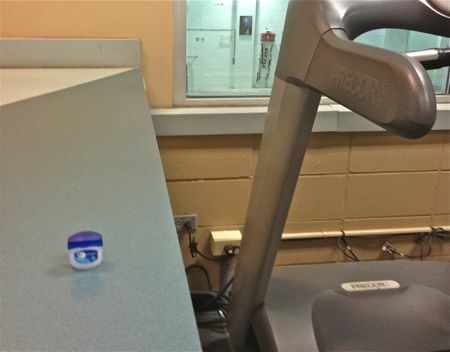 I was only 2.25 miles in when I had to get off the treadmill and search the gym for some vaseline. Luckily I have no problem with asking everyone I work with if they have any and my Y director had a travel sized container she didn't mind parting with, so glad because otherwise I would of had to go home for some spandex. I made it to 7 miles at the gym. 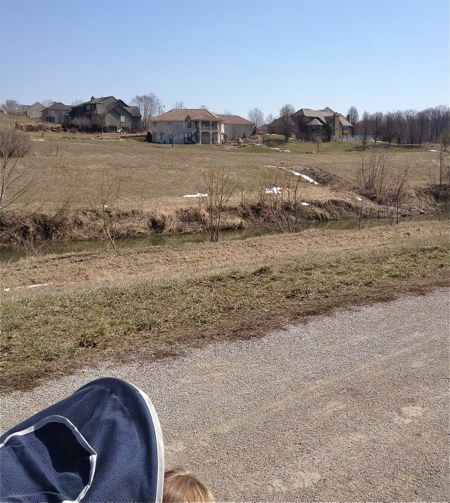 Finally had some nice weather so took Gretchen out to the trail in the jogging stroller for 3 miles. Those 3 miles were not great, the ground was really soft from all the melted snow and my legs weren't into it but done anyway. Crazy big houses by the trail. I always think about how I'd like to move into their guest quarters so I could be right by the trail. Would just have to build a little bridge over the river. So much better than driving to the trail. I have a feeling running a decent amount when you really don't feel it, is as beneficial as running a little more the weeks that it is easy. Also I never understood why there is no bridge for the people in the big houses, why would you want to live in such an expensive house within sight of the trail, but still have to drive to the parking lots on the other side, just like everyone else. Maybe there is a magical trail on the other side of the houses.